Lots about the next World of Warcraft expansion, Warlords of Draenor, is being kept under wraps but as we get closer to Blizzcon and the expansion’s release date Blizzard are starting to pull back the blanket and show us what’s underneath. Oh God, look away, it’s a dissected murloc! Wait, no, it’s a new land for us to explore, Gorgrond, and it’s absolutely filled to the brim with wild beasts. First up are the Botani, who like a good deal like Swamp Thing, except without that dominating brow. In fact, their similarities to the comic book character go deeper. Like Swamp Thing, the Botani tend to the jungles, ensuring their continued existence even if it means sentient creatures need to die. There’s no word on whether they’re biomatter containers for the memories of dead scientists but time will tell. The Goren don’t just make armour from the crystals but are able to turn them into projectiles. When they’re in a pack they can become a formidable enemy. 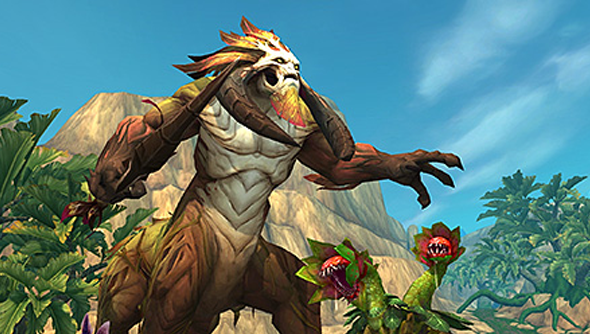 A third faction in Gorgrond are the Infested, an offshoot from the Botani. A result of a seeding process, the Botani have raised an army of mindless zombies from the local natives. It’s not all bad, they’re basically walking seed pods, so wherever one dies the ground is both fertilised and planted. Saving the best till last, Gorgrond has its own population of demigods, the Genesaur. They’ve been wandering around Gorgrond for thousands of years, largely doing their own thing. If you’re to come across one it’d be wise to keep your distance, particularly as the Botani can communicate with them and, as mentioned earlier, the Botani don’t much care for your type around here. And that just covers the beast factions. There are all sorts of armies battling over Gorgrond and you’re right in the middle of it all. Warlords of Draenor’s release date is 13 November.